GroundwaterWater beneath the Earth’s surface that flows through soil and rock openings (aquifers). and surface waterWater collecting on the ground or in a stream, river, lake, wetland, or ocean. monitoring activities has continued since 1997 as part of the Resource Conservation and Recovery Act (RCRA) RCRA Facility Investigation/Remedial Investigation (RFI/RI)An investigation that occurs in the corrective action process following a Facility Assessment under RCRA and/or a Site Inspection under CERCLA. It is an in-depth study designed to gather data needed to determine the nature and extent of contamination at a site. Installation and monitoring of additional wells have occurred throughout the years. Currently, there are approximately 140 groundwater monitoring wells sampled routinely. 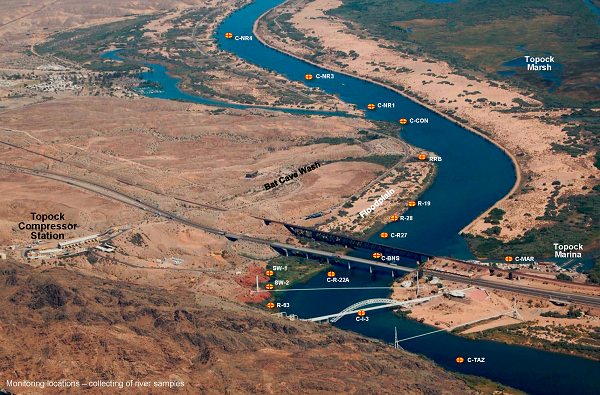 Five wells installed in 2007 are "slant" or angled wells, extending underneath the Colorado River, and allow for water samples to be collected below the river. Five vertical wells and three slant wells were also installed on the Arizona shoreline in March and April 2008. Based on sampling results collected over the years, the agencies and the Pacific Gas and Electric Company (PG&E) have been able to determine the location and depth of the groundwater plume A body of contaminated groundwater. The movement of a groundwater plume can be influenced by such factors as local groundwater flow patterns, the character of the aquifer in which the groundwater is contained, and the density of contaminants.for cleanup purposes. 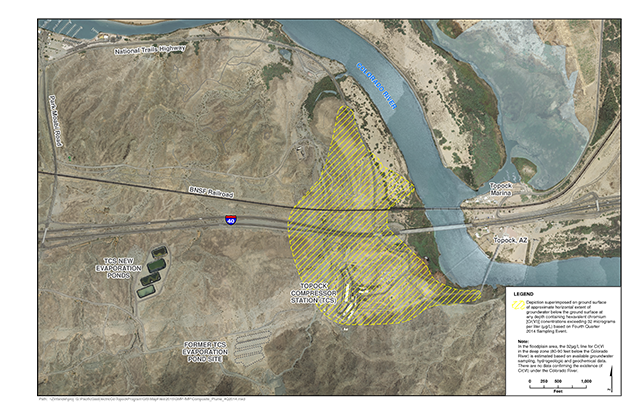 Furthermore, the monitoring results show that the quality of the Colorado River is not adversely impacted by the hexavalent chromium plume at the Topock Project Site (Site). As part of the Groundwater Monitoring Program, PG&E is also conducting sampling and analysis for other constituents and water chemistry parameters in select wells. Monitoring results are submitted by PG&E to the DTSCThe department within the California Environmental Protection Agency in charge of the regulation of hazardous waste from generation to final disposal. DTSC oversees the investigation and cleanup of hazardous waste sites. and the U.S. Department of the InteriorThe United States department charged with conservation and development of natural resources. The U.S. Department of the Interior uses sound science to manage and sustain America’s lands, water, wildlife, and energy resources, honors our nation’s responsibilities to tribal nations, and advocates for America’s island communities. in quarterly monitoring reports. DTSC shares these reports with the Consultative WorkgroupA focused stakeholder subgroup of the Consultative Work Group (CWG) where various stakeholders and their consultants discuss technical project related issues in greater detail which are then reported back to the CWG. and places them in the information repositoriesDesignated locations that provide public access to site-related documents as required by the DTSC. in the surrounding communities and in this website’s Document Library. Monitoring reports can be found here. To view figures showing current groundwater and river sampling locations, or the most recent plume maps based on quarterly groundwater data, please click on the figures below.